The brightest light at the inauguration of the 30th anniversary season of VIDEODANSE was the celebration itself, honoring Michèle Bargues, the program's founding force, who retires this year. A sociologist working in the human services department at the museum's beginning in 1977, she knew very little about dance at the time. The opportunity to develop the dance-video program came about by chance, rather than design. She did a lot of quick research and learned fast. And fell in love with dance, she says. 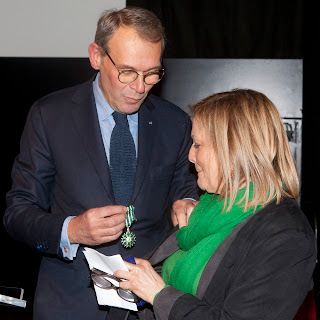 The former President of the Centre Pompidou, Jean Jacques Aillagon (also the former Minister for Culture and Communication), was at hand to publicly present her with the medal and rank of Chevalier dans l'Order des Arts et des Lettres. Aillagon noted that if dance video is recognized now it is thanks to Bargues' work at the Centre. VIDEODANSE wasn't intended to be an annual event, just a one-off, and now we have not only dance films documenting and archiving dance history, but also dance-video as a new artistic form in its own right, stretching the limits of both traditional dance and traditional film. The film on screen for the evening was a dance documentary called Bonhomme de Vent by Iranian filmaker and visual artist Sima Khatami. It follows the creation of a performance piece called La Danseuse Malade (The Sick Dancer) by Boris Charmatz with Jeanne Balibar, inspired by the text of Butoh's founding artist Tatsumi Hijikata. The camera follows the two performers, often intimately, through an arduous and self-punishing process that leads up to the first presentation of the work. It feels like a real life, raw and 'in your face' version of The Red Shoes to me, with all of the masochistic tendencies of artists invested in the idea that abuse and suffering are integral to the creation of their work. There is something deeply -- profoundly -- skewed here, but the work was so strongly language-based, and naturally in French, that I missed too much to even attempt an analysis. The title of the dance is appropriate anyway. One particularly satisfying thing about living here in Paris is the relationship between the people and art, which fully includes dance and dance film if you happen to be at the Centre Georges Pompidou. Here, art is not expected to serve as entertainment in order to be valued. It is not required to be financially profitable in order to be recognized as having value. It is okay to be disturbed, and it is okay to dislike a work. It isn't that there is no appreciation of pleasure in art, but pleasure isn't the primary criteria by which a work is valued or assessed. A couple of years before Anna Sokolow passed away, a young (and very sincere) dancer told Anna how much she "enjoyed the show." Thoroughly offended, Anna bristled, gathered herself into the resolute force of nature she could be and said "We are not here to enjoy. We are here to think and feel." The exhibits I have seen at the Pompidou Centre, have displayed a knack for stimulating thought and feeling -- and discussion. This evening was no exception. VIDEODANSE has more than 200 films playing over the coming weeks, with a wide array of artists from the classic modern to the avante garde, and all of them are free to the public. The practice of compassion begins at home. It begins by accepting where and how we truly are, recognizing our expectations and aspirations, as well as our limitations and weaknesses. Through our physical practice of asanas and pranayama, we work from this point of honesty and acceptance to claim our actual strength, become conscious of areas that need reinforcement and care, and to accept our unique gifts. This workshop is dynamic and open to all levels. Enrollment is limited to 8 participants.